Disclosure: I received supplies for review from My Paper Shop. All opinions are my own. I love party planning but not the stress that comes along with it when you are a one-person shop. Since Kenzie has been obsessed with Frozen for over a year, naturally it was her theme selection. Once the theme was set, it was time to think about decorations and supplies. Since I knew the decor would be driven by the movie characters, it is ideal to mix in clean, solid colors to neutralize the party while staying in the theme. My Paper Shop provided just the right essentials to complete the party. With exception of the main food selections, I prepared all the desserts and snacks. I was inspired by Pinterest and was ready to tackle the spread. The Jello Parfaits were a hit with the kiddos and I was surprised because usually I end up with leftovers when Kenzie wants it at home. I think the kids were fascinated by the "teeny, tiny" mini silver tasting spoons and clear plastic square bowls. These products are available in a large quantity so great for using on multiple parties/occasions. Let's just say Kenzie had parfaits 3x! My rice krispy pops were a bit more giant than I anticipated but the kids loved them nonetheless. The blue and white stripe paper straws are trendy and make for a wonderful handle for the kids to grab onto while noshing on the treats. 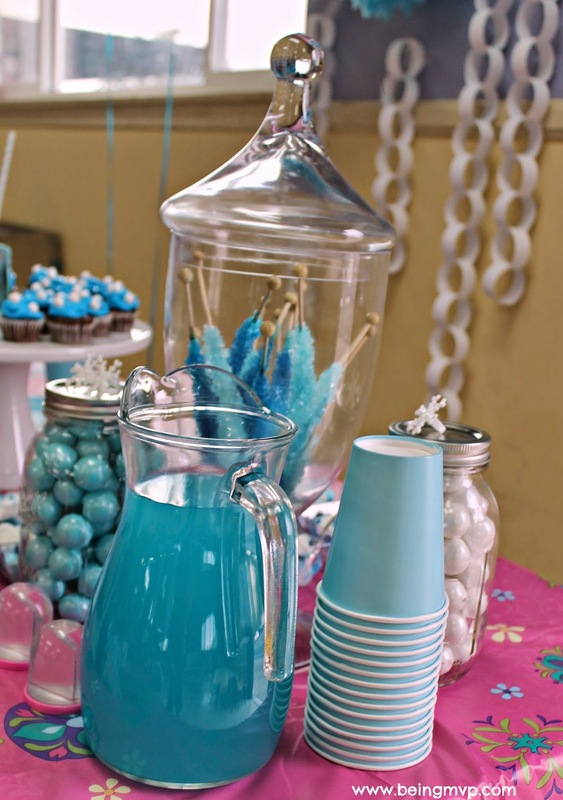 The "Frozen" lake juice was served up in pastel blue paper cups with the striped straws. The kids were definitely intrigued by the blue color and refills all around! The 9 ounce size of the cups are perfect for little 4-5 year old hands. They can be used with both hot and cold beverages so it would have been fun to even have hot chocolate for the Frozen party. 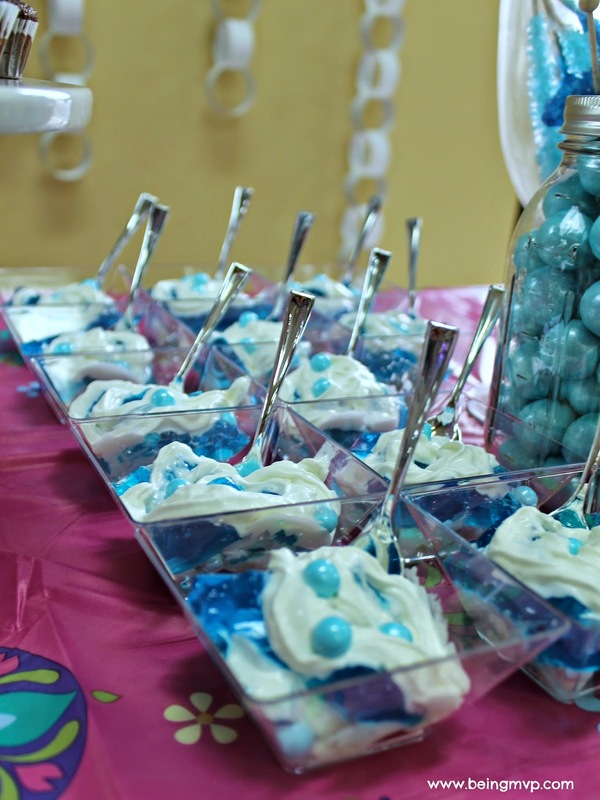 The pastel blue dessert plates were just the right size (5 inches) to pile on the various desserts. The silver mini tasting forks got the giggles going again with the kids. I am definitely going to use mini size everything for future parties since now I know how much the kids enjoy (and eat). I was surprised at how much the kids actually finished because the year before, they barely ate anything and it was a waste of hard work (on my part). There must be growth spurts happening with her friends! These plates are also great for appetizers when hosting a get together with friends. 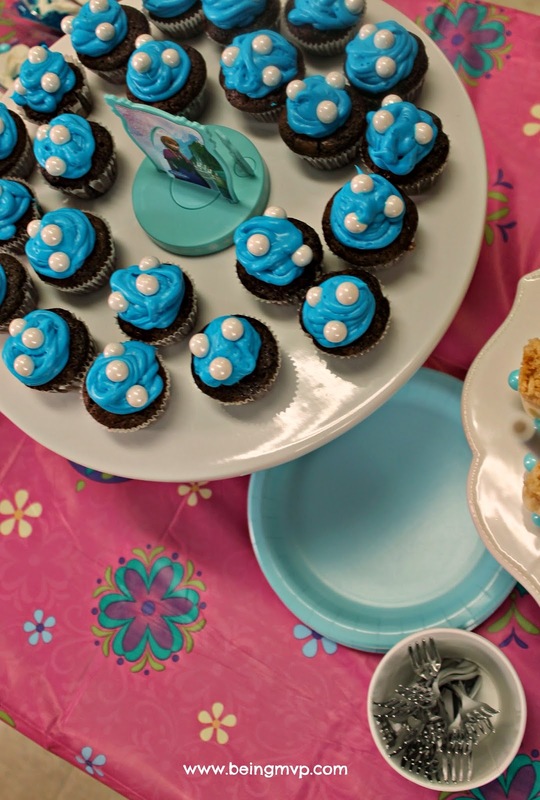 The plates were also used for the cake at Kenzie's 1st party. Kenzie has a fondness for pinatas. I don't know why but it seems like every birthday party we attend has a pinata regardless of theme. However, I've never seen anyone have some sort of bag available to the kids to stuff their goodies in. The pastel blue polka dot cello bags from My Paper Shop were just the right size to fill with candy and small toys. A twist tie is included so the kids could fill up and close after diving to grab the treats. These bags were also nice for the kids to tie their balloons on after the party. The party was a hit and I am now a huge fan of My Paper Shop. They have everything you need for any occasion with themed party selections as well as color specific. Have you seen the cute Valentine's Day party supplies? Do you have a party coming up? What are some of your must have party supplies from My Paper Shop? Wow, the jello parfaits look amazing! I really like the Frozen Birthday Party supplies. The bowls are so pretty, and the silver spoons are awesome at the party. I want to get some of these supplies for my niece's birthday in April! Adorable! I love the table with all the blue and white decorations and foods! 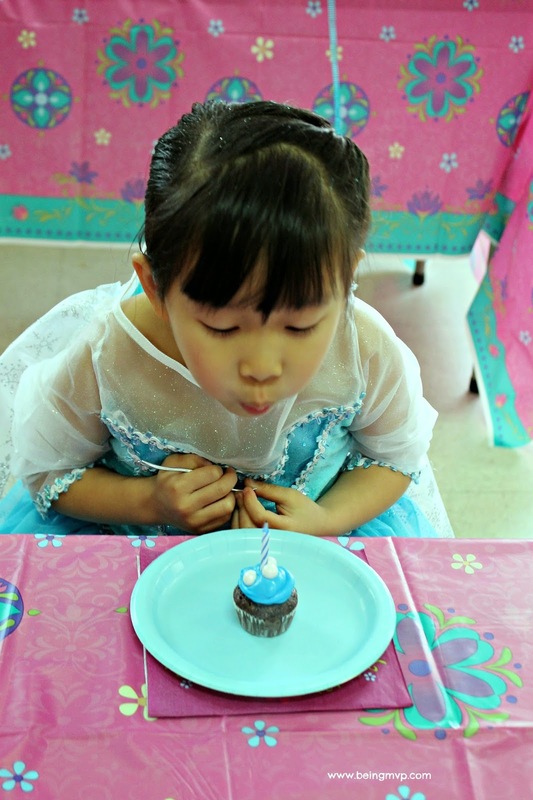 How cute is this Frozen party? I know so many little kids who would have loved this. How cute....Such creativity and I know she loved her party. What a cute party layout! I love all the light blues! They fit perfectly with the FROZEN theme! 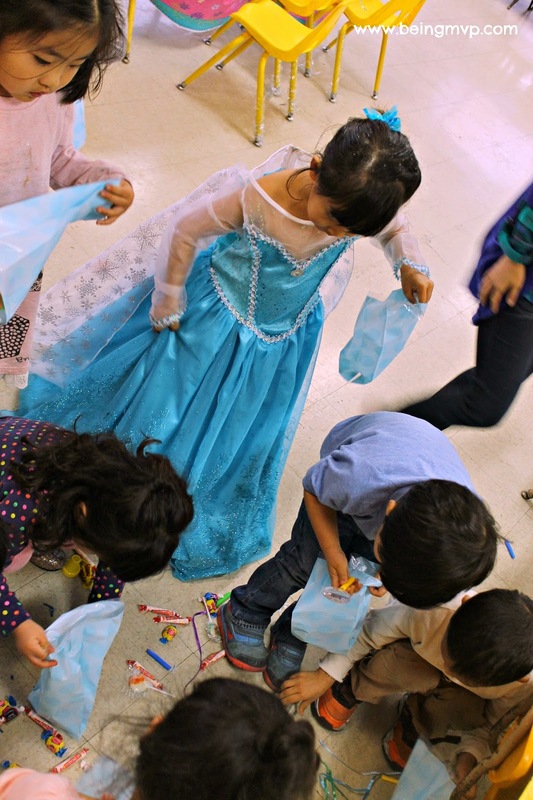 How lovely, we had a Frozen party last year. This looks great, I love the cupcakes. What a cute par-tay idea! I love how the cupcakes came out. What a gorgeous setup. You did such an amazing job with the party AND with the photography. Wonderful. What a pretty party!!! I love Pinata's at party's they are always fun for the kids! Wow this themes is amazing! The colors are so vibrant. I'm loving the rice treats! What a cute little princess! 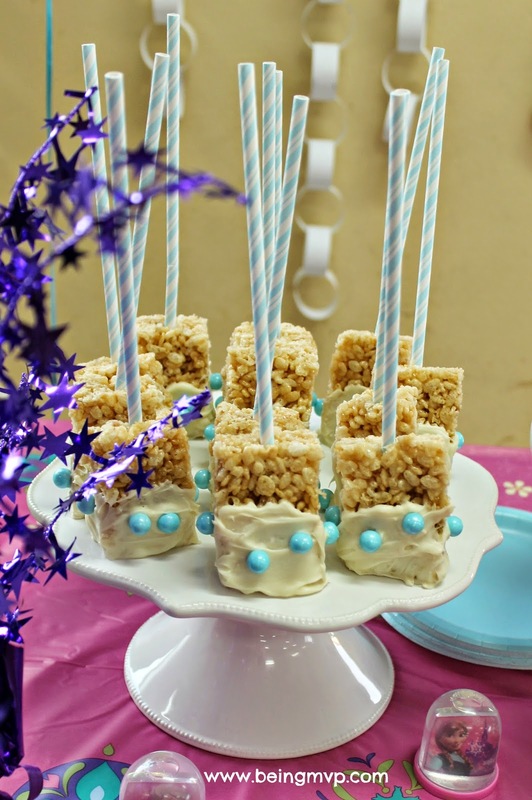 Love those Rice Krispie pops! Can't live without fun straws! This looks like it was a great party. I love the Frozen theme. The decorations are great. Holy cow... that is one amazing looking party! You did an amazing job! Your party was so creative! Your daughter's birthday looked amazing! Love the paper goods and SweetWorks candies! Oh my goodness, your daughter is just precious. So pretty in her Frozen dress and with her hair fixed just right. I appreciate learning about new paper/party supplies too. Thanks! !